Just over a year ago, on March 1, 2018, President Trump announced that he was using existing authorities to impose tariffs on imports of steel and aluminum (Swanson, March 1, 2018). This was the first in a series of actions taken by the Administration on trade that included a significant conflict with China. In Part I of this two-part series, we review the trade conflict after one year including retaliation of trading partner countries, impact on agricultural exports, and reaction in commodity prices. The Trump Administration’s announcement of steel and aluminum tariffs on March 1, 2018, was justified as a response to Chinese intellectual property rights and technology policies. While the trade conflict is primarily between the U.S. and China, the widespread imposition of steel and aluminum tariffs has also prompted other countries including Canada, Mexico, the European Union (EU), and Turkey to retaliate against the U.S.
As anticipated given historical precedent, U.S. agricultural products have been a prime target as countries act in retaliation to U.S. actions (see farmdoc daily, October 4, 2017). Agricultural goods are not only politically sensitive but the agriculture industry also relies heavily on world trade. In recent years the U.S. has been the number one exporter of agricultural products in the world. Further, a replacement for many U.S. agricultural products can be sourced from other trading partners. Over the past year, more than 800 U.S. food and agricultural products have been targeted with retaliatory tariffs from China, Canada, Mexico, EU, and Turkey. These retaliating countries are among the leading U.S. agricultural and food export markets. India has issued intent to begin imposing retaliatory tariffs on select U.S. products, including some agricultural products. While also a retaliating country, Russia has targeted industrial goods. The reduction in markets due to tariffs are likely to impact commodities that are most dependent on exports to the retaliating countries, particularly if those countries can import from an alternative source. According to a report prepared by the Congressional Research Service (CRS, Dec. 31, 2018), the U.S. exports more than 30% of the total production of several agriculture commodities, including soybeans and pork, to retaliating countries. Among all retaliating countries, China has responded with the most expansive list of retaliatory tariffs on imports from the U.S. More than 800 U.S. products, including almost all U.S. agricultural and food exports to China, are subject to additional tariffs of 5%, 10%, 15%, 20%, 25%, or a combination of these tariff levels. Canada, Mexico, Turkey, and the EU have each levied tariffs on between 8% and 14% of U.S. agricultural and food exports. China is U.S. farmers’ single largest soybean customer, purchasing more than half of U.S. soybean exports. Illinois soybean farmers also rely heavily on the soybean export market, exporting approximately two-thirds of the soybeans grown in the state. With a Chinese retaliatory tariff of 25% on U.S. soybeans, the commodity is subject to a total tariff rate of 28%. Although other retaliating countries have not levied retaliatory tariffs on soybeans, soybeans are significantly impacted by the action of China alone due to heavy reliance on exports as a market for the crop and the substantial portion of soybeans that are normally exported to the single customer. Mexico and China, the second- and fifth-largest U.S. pork export markets, have levied retaliatory tariffs on U.S. fresh and frozen pork, impacting up to 30% of the value of U.S. pork exports. Chinese tariffs on pork vary by product. China levied two rounds of 25% retaliatory tariffs on some U.S. pork products, resulting in tariffs of up to 70% on some U.S. pork products when added to tariffs in place prior to retaliation. Other major Illinois commodities, corn, beef, and wheat are also subject to the Chinese 25% retaliatory tariffs, on top of previously existing tariff rates for each commodity. However, the percent of total production exported to China for these commodities is not as significant, and therefore the impact is lower. While these commodities are subject to prior existing tariffs in some export markets, the other retaliating countries have not targeted corn, beef, or wheat with additional retaliatory tariffs. 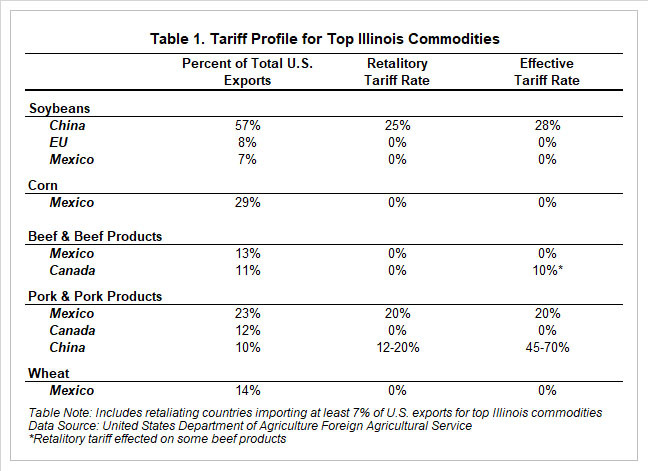 A tariff profile for the top Illinois commodities is shown in Table 1. For retaliating countries importing at least 7% of U.S. exports of a given commodity or commodity group, the retaliatory tariff rate and the effective tariff rate (previously existing tariff rate plus retaliatory tariff rate) are reported. 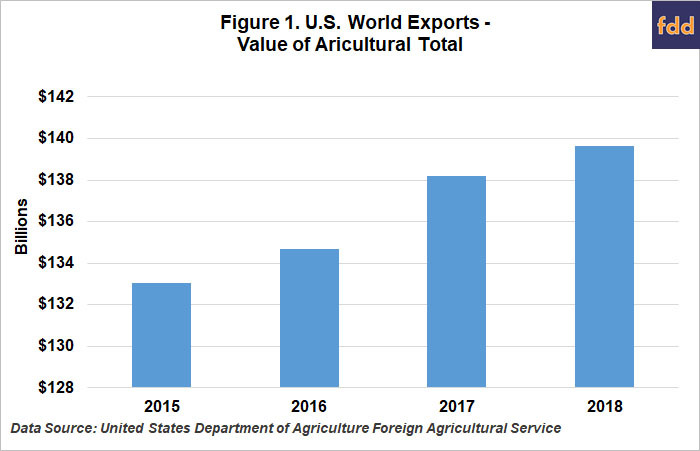 According to data retrieved from the United States Department of Agriculture Foreign Agricultural Service’s Global Agricultural Trade System database, the value of total U.S. agricultural product exports in 2018 were actually higher than, although consistent with, recent years. 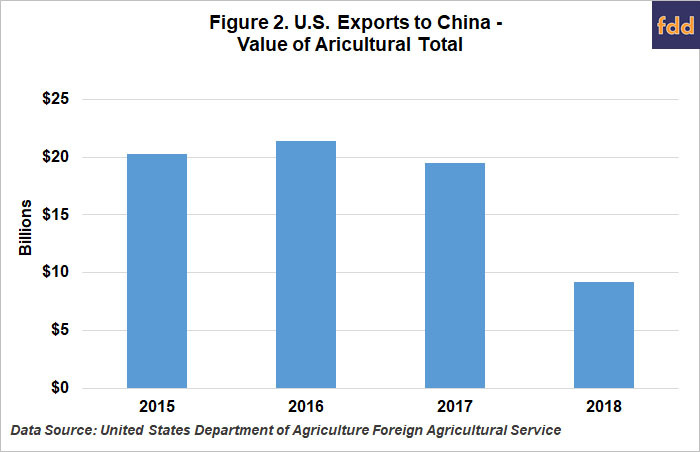 However, after the imposition of Chinese retaliatory tariffs, the value of 2018 agricultural exports to China were less than half the annual value for each of the three prior years. This severe of a decline in a single year put great pressure on the agricultural commodities and products normally exported to China. Given that China has, in recent years, purchased over half the soybeans produced in both the U.S. and Illinois, implementation of retaliatory tariffs had a significant impact on exports of U.S. and Illinois soybeans to China. 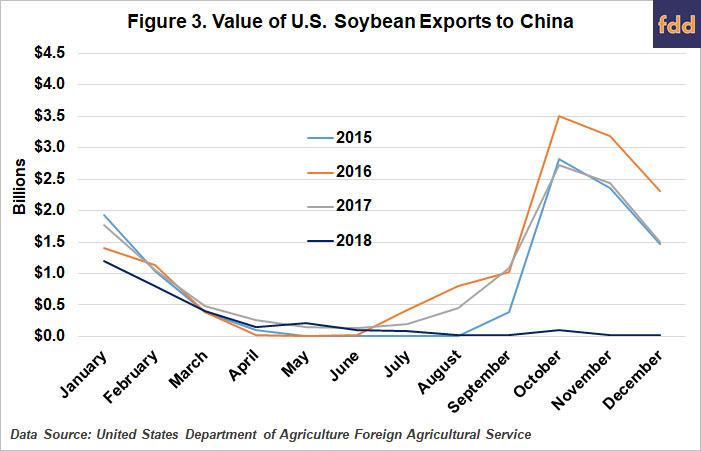 A comparison of the value of U.S. soybean exports to China by month from 2015 through 2018 shows the substantial difference in exports from September through December 2018, as compared to prior years, in months when the seasonal flow of soybeans would normally be at a peak. With a finite amount of soybeans in the world market, some speculation is that U.S. soybeans could be replacing demand in other trade markets. 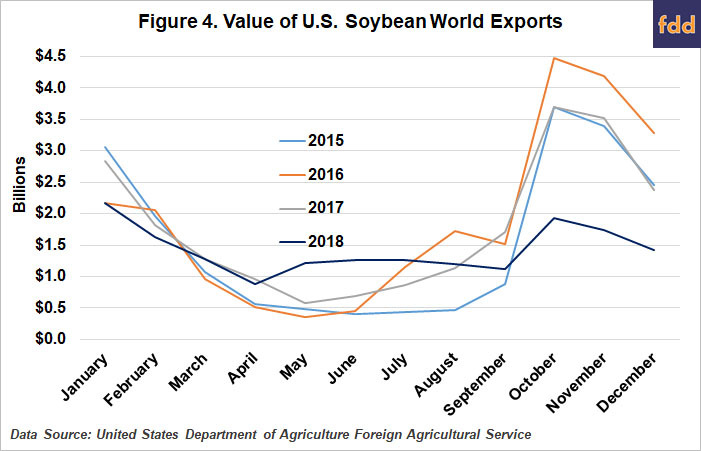 Based on data reported by USDA, however, the difference in the decline between world soybean exports and U.S. soybeans exports indicates that only about one-third of U.S. soybeans found a new export market outlet from September through December 2018. In particular, the drop over that four-month period in which the U.S. soybeans crop is harvested and normally reaches peak export levels provides clearly that soybean exports suffered on the world market. With less demand in the world market for U.S. soybeans, American farmers received lower prices for their crop. In 2018, the cash price in central Illinois, reported by the United States Department of Agriculture’s Agriculture Marketing Service (AMS) fluctuated between $7.45 and $10.34 for soybeans and $2.92 and $3.78 for corn, representing swings of 28% and 22%, respectively, for the two commodities. Major swings in price correspond with notable trade events (see farmdoc daily July 31, 2018 and October 11, 2018). 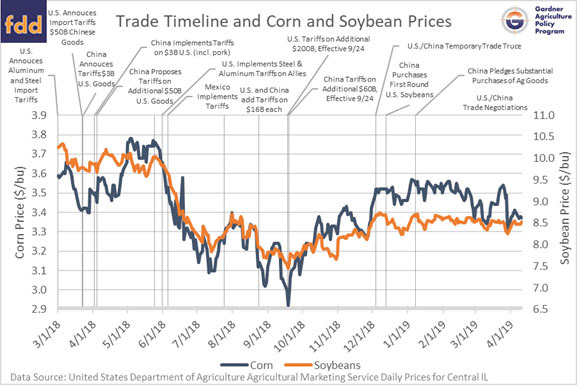 Corn and soybean prices have been relatively stable at near midpoint levels from December 2018 through March 2019, corresponding with the temporary trade truce and ongoing negotiations between the U.S. and China as well as the resumption of Chinese purchases of U.S. agricultural commodities. As in previous trade conflicts, U.S. agricultural products have been a prime target for retaliation given their heavy reliance on world trade, ability to be replaced by other commodities or trading partners, and their political sensitivity. More than 800 U.S. food and agricultural products have been targeted with retaliatory tariffs from China, Canada, Mexico, the European Union (EU), and Turkey, several of the U.S. largest agricultural and food export markets. Among all retaliating countries, China has responded with the most expansive list of retaliatory tariffs including almost all imports of agricultural and related good from the United States. As a result, the value of 2018 agricultural exports to China were less than half the annual value for each of the three prior years. China is the only country to have levied retaliatory tariffs on soybeans, but that alone has significant impact given that China has in recent years purchased more than half of U.S. soybean exports. As a crop that relies heavily on exports as a market, less demand in the world market pushes the farm price lower. In upcoming Part II of this two-part series we will estimate the impact of trade conflicts on Illinois agriculture in 2018.